On October 21, 2014, Hazel Green Elementary hosted a workshop for Physical Education teachers representing the schools chosen in the north half region of the state to participate in the Wee Can Fight Obesity program. Suzanne Stone, the ASF Foundation’s Physical Education Advisor for the North Region administered the workshop. Teachers in attendance were provided a tutorial on the program and how to set-up the equipment. At the conclusion of the workshop, each teacher received the Wee Can Fight Obesity equipment that was donated to their schools on behalf of the Wee Can Fight Obesity Partners. 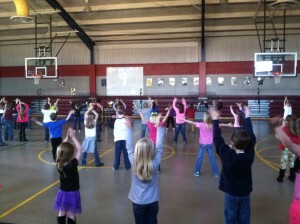 Hazel Green Elementary students demonstrate the program to teachers in attendance.